Faculty experts and campus newsmakers who work with the University’s News and Communications office have a new resource available to them when it comes to media interviews. The news office now operates a fully equipped, professional television studio that is capable of transmitting broadcast-quality HD video to broadcast news media organizations around the world. 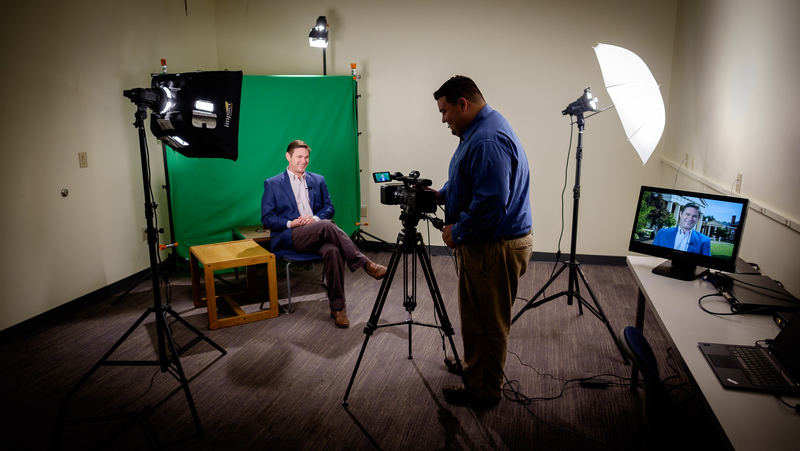 Now when media seek commentary on timely news topics, faculty and other experts can share their expertise for live and pre-recorded interviews in high-definition with the latest technology right here on campus. The television studio is conveniently located in the heart of campus in Z. Smith Reynolds Library, behind The Bridge. While the news staff members serve as the main point of contact for media outlets, reporters and producers often reach out directly to individuals. If this happens, the news office asks that those individuals please promptly direct them to a member of the news team to facilitate the request in a timely manner. The entire team can be reached at media@nullwfu.edu or (336) 758-5237. The studio was made possible as part of a generous donation from the Clark Family Foundation, as part of Wake Will: The Campaign for Wake Forest. An open house for faculty and staff will be held in the studio from 3 – 5 p.m. on Wednesday, Oct. 21. Additional information about the studio is available here.